The bustling capital Tehran; deserted caravanserais once used by traders along the silk road as recovery places; impressive mosques appearing in mythic colors at dawn; atmospheric tea houses along narrow side alleys ocolourful bazaars; splendid oases in otherwise vast deserts; shepherds taking care otheir sheep in rugged mountain ranges with snow covered mountain peaks – these are only a few othe fantastic highlights that can be encountered in contrast-rich Iran. Yet, stunning sights and wonderful nature are only one part owhat makes this country so unique. Much ovisiting Iran is about encountering the welcoming hospitality othe people and their endless curiosity towards foreigners. and reveals the complex and long history of this area. We will gain insight into ancient cultures and traditional life and link it to the modern lifestyle that takes place on the streets ofTehran and Esfahan. On this trip, we will feel the hospitality ofthe people and their welcoming attitude. This will not be without uncovering their endless curiosity towards westerners and their interest in learning how we think about Iran and its people. Last but not least, we can see different landscapes and understand how the inhabitants used basic technology and natural elements to master their life in the often harsh environment they are living in. Our trip starts in Tehran, the capital ofthe country. We will then continue to see some of the country’s best highlights by visiting the desert town oYazd and the beautiful city of Esfahan with its impressive palaces and mosques. Escaping to the desert for a few days brings tranquility while staying in an oasis and gazing at stars during the crystal clear nights. CHF 4370 in double rooms. Single room supplement is CHF 350 (where possible). We start our trip with a tour around the bustling capital Tehran. By visiting the Bazaar and other sights, we have the opportunity to immerse ourselves into the city life and feel its vibes and contrasts between modernity and tradition as well as between liberal visions and conservative rules. In the afternoon we will board the train from Tehran to Yazd. During this comfortable six hour train ride we get a first glimpse of the vast desert landscape which seems to stay the same for hours and hours. In the evening we will arrive in Yazd. We explore the city of Yazd. This oasis city is one of the oldest in Iran. Because of its remote desert location and the difficulty of access, Yazd remained largely immune to large battles and the destruction and ravages of war. Yazd is also an architecturally unique city. The Bādgirs (wind towers) give a distinction to Yazd’s cityscape. The towers are a masterpiece of ancient engineering as they serve as ventilation systems to cool down houses without the need for electricity. We will have a full day to explore the city and its surroundings. In the evening, we will attend a Zurkhaneh training, a traditional sport used to train warriors that is still being practiced. Our desert trip starts. We leave Yazd and drive north towards the city of Mesr. On the way we will visit Chack Chack, an an important pilgrimage place for Zoroastrians situated in a spectacular scenery. We will also visit Kharanaq, an abandoned caravanserai, which was previously used by silk road traders to stay overnight and feed their camels. We venture further into the desert. This time by 4WD and on foot. On our hike, we will learn a lot about the desert itself and how the locals made use of the geological characteristics of the area in order to be able to survive in this hostile place. We will stay overnight in the desert and sleep under the sky – a unique experience to enjoy a magnificent view on the stars in the absence of any light pollution. We are leaving the desert in the morning and drive towards Esfahan. On the way we will stop at the cultural sights of Jandagh, an archaic desert city and Choupanan oasis situated in a sandy landscape coloured in rose gold. Esfahan is a unique city with its impressive mosques, palaces and bazaars. Esfahan is also an upcoming economical city with a lot of culture and young, curious students that are eager to bring change to the country. We will spend the day visiting the famous highlights like the Maidan square and Masjed-e Shah mosque and and immerse into the city life. In the evening we can relax along the city’s river as many locals do. We leave Esfahan in the morning and drive towards Hamadan with many archeological sights on the way. The next few days we will spend in the Kurdish region of Iran. The Kurds have a distinct culture, which differs from the rest of the country. The people, however, are as friendly as everywhere else in Iran and eager to explain their history and culture. After a city tour around Hamadan, we continue towards Kermanshah. Today we start our tour to the spectacular Howraman valley. The route goes into the mountain region and follows the Iraq/Iran border for some segments of the trip. In the late afternoon we will arrive in Howraman-at-Takht, a small village situated impressively on the hill side of the valley. A homestay will be our accommodation for the night. We leave Howraman-at-Takht in the morning and continue our trip through the Howraman valley. By lunchtime, we will arrive in Merivan where we have the chance to have lunch next to the lake. This also marks the end of our trip to the Howraman valley. On our onward journey towards Sanandaj we will stop at Negel to visit the local mosque. While inconspicuous, this mosques exhibits of the oldest Korans in the world. We continue to Sanandaj where we stay for the night. Today we will drive from Sanandaj to Qazvin, a busy city in the north, close to Tehran. On the way we will stop at various sites including Soltaniyeh, an impressive mauseoleum in Zanjan. We leave Qazvin in the early morning and start our trip to Garmaroud. A drive through the mountains over a pass will bring us to this remote place. On the way we will stop and climb to the ruins of Alamut castle, a castle of strategic importance to the Assasines, one of the worst terror groups of the region in the middle ages. We will reach Garmaroud in the late afternoon where we will have time to explore the mountainous surroundings, which are very different from the previous places. During the next three days we will be hiking around the Alamut Mountains. We start in Garmaroud, pass the mountain chain and reach the Caspian sea two days later. The scenery is stunning. The landscape dramatically changed from the previous days: The deserts switched to green meadows and alpine rock formations. Snow covered mountain tops become visible. We will stay for two nights in basic accommodations in small settlements. There is no need to carry all of our luggage as our driver is waiting for us at the end of our hike on the other side. On day 16, we will have time to enjoy and relax around the Caspian sea. This part of Iran is also considered as ‘The Jungle’ as the evergreen forests form a big contrast to the desert-like and mountainous regions covering the rest of the country. We say goodbye to the sea but not yet to the mountains. We drive back to Tehran through the Alamut mountains and arrive in Tehran in the evening where our trip ends. The tour will be guided by a Swiss guide of Beyond Travel. A knowledgeable, local, English speaking guide and a driver will assist us during the trip. Some activities require specific clothes and a good physical condition. We will provide a detailed packing list so that customers can prepare accordingly. A solid fitness is required for the hikes. The professionals who accompany the participants will apply all their skills to lead the group towards the realization of their objectives in the best possible conditions of safety. Participation is at your own risk. Due to changing political situations, a modification of the program might be necessary even on short notice. At the time of writing this document, the Swiss Federal Department of Foreign Affairs did not issue a warning for most of the regions which will be visited during this trip. A visit to the Iran-Iraq border region is not recommended by the FDFA. Our trip to Howraman valley will pass along a short segment of the border. We will constantly evaluate the situation. Meteorological conditions, the conditions of the ground, the physical shape of the participants and their capacities are crucial elements which can lead to any modification or reevaluation of the excursions. The passage from Garmarud to the Caspian sea might still be covered in snow. Under these circumstances, an alterantive route will be chosen. Swiss citizen and many other nationalities require a visa to enter Iran. Please inform yourself in advance how to obtain a visa. Beyond Travel can provide support. Our tour starts and ends in Tehran. Participants are asked to book the flights by themselves. Beyond Travel will provide recommendations on connections. Usually, Pegasus Air (www.flypgs.com) from Zurich via Istanbul and Iran Air (iranair.com) from Frankfurt have good connections. Our tour is scheduled to meet Iran Air’s flight schedule. Please contact Beyond Travel for further information. Iran – ein Land mit tausendjähriger Geschichte und ein Land, das sich ständig im Umbruch befindet. Wir möchten in diese faszinierende und facettenreiche Region voller Gegensätze eintauchen und versuchen, das Land etwas besser zu verstehen. Auf unserer Reise besuchen wir mit Esfahan und Yazd zwei kulturelle Highlights des Landes. Wir besuchen aber ebenfalls das wenig bereiste Howraman-Tal im Kurdengebiet und lernen da eine ganz andere Kultur und Mentalität kennen. Neben einer Nacht unter dem Sternenhimmel in der Wüste gibt es es auch einen Abstecher in die Berge, wo wir bei einem mehrtägigen Trek abgelegene Dörfer und ihre Bewohner besuchen, welche uns herzlich empfangen werden. Der Preis für die Reise beträgt CHF 4370 pro Person. Der Einzelzimmerzuschlag beträgt CHF 350. Wir beginnen in Tehran und besuchen den lokalen Bazaar und weitere Sehenswürdigkeiten. Wir tauchen ein in diese kontrastreiche Stadt zwischen moderner Jugend, alter Kultur und konservativem Weltbild. Am Nachmittag nehmen wir den Zug von Tehran nach Yazd. Diese gemütliche Fahrt bringt uns durch die unendliche Wüstenlandschaft, welche sich während Stunden kaum verändert. Wir besuchen die Oasenstadt Yazd, welche dank ihrer Abgelegenheit während Jahrhunderten von Krieg und Zerstörung verschont geblieben ist. Wir haben einen ganzen Tag, um die Stadt und ihre Sehenswürdigkeiten zu erkunden. Unser Trip in die Wüste beginnt. Wir verlassen Yazd und fahren in den Norden in Richtung Mesr. Auf dem Weg besuchen wir Chck Chack, ein imposant gelegenes Kloster und ein wichtiger Pilgerort für Zoroaster. Wir machen ebenfalls halt in Kharanaq, eine verlassene Caravanserai, welche Händlern entlang der Seidenstrasse als Unterkunft gedient hat. Heute geht es noch tiefer in die Wüste. Wir nehman dazu 4WD Fahrzeuge und wandern die letzten Kilometer. Während unserer Wanderung lernen wir viel über die Wüste, ihre Bewohner und wie man in der Wüste überleben kann. Es ist erstaunlich, welche Infrastruktur die Einwohner aufgebaut haben, um ihren Wasserbedarf decken zu können. Wir übernachten in der Wüste und haben die Gelegenheit einen einmaligen Sternenhimmel zu bestaunen. Wir verlassen die Wüste und fahren nach Esfahan. Auf dem Weg gibt es weitere Sehenswürdigkeiten wie Jandagh, eine Wüstenstadt und Choupanan eine hübsche Oase. Esfahan ist eine einzigartige Stadt mit imposanten Moscheen, Palästen und Bazaars. Esfahan ist aber auch eine aufstrebende Stadt mit vielen jungen Leuten, welche nach Öffnung und Kultur streben. Wir besuchen die Sehenswürdigkeiten wie den Maidan Platz und die Masjed-e Shah Moschee und tauchen in das Stadtleben ein. Den Abend lassen wir am Stadtfluss ausklingen, so wie das viele Einheimische auch machen. Wir verlassen Esfahan am Morgen und fahren nach Hamdan. Stops auf dem Weg. Die nächsten Tage werden wir im Kurischen Teil Irans verbringen. Die Kurden haben ihre eigene Kultur erhalten. Die Leute sind aber mindestens so freundlich wie in den andern Gebieten des Irans. Nach einer Stadtbesichtigung fahren wir durch imposante Landschaft von Hamadan nach Kermanshah. Heute fahren wir in das spektakuläre Howraman Tal. 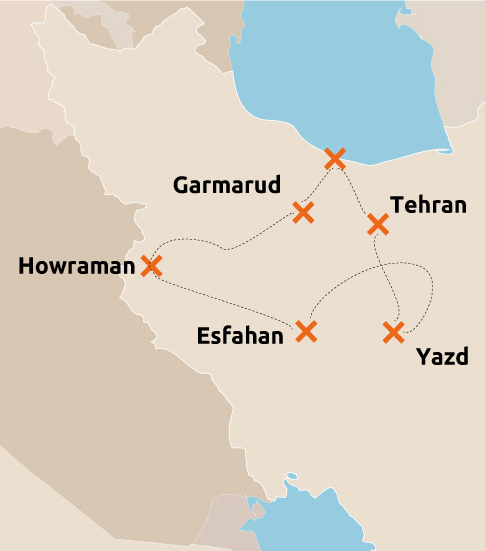 Die Route bringt uns in die Berge und folgt der Iran/Irakischen Grenze für einen Abschnitt. Am späten Nachmittag erreichen wir Howraman-at-Takht, ein kleines Dorf welches malerisch am Berg gelegen ist. Wir verlassen Howraman-at-Takht in den Morgenstunden und fahren weiter durch das Tal. Zur Mittagszeit erreichen wir Merivan. Dies ist auch das Ende unserer Reise durch das Howraman Tal. Wir machen uns auf den Weg nach Sanandaj. Auf halber Strecke besuchen wir die Moschee von Negel wo einer der ältesten Korans aufbewahrt wird. Unsere Reise führt heute von Sanandaj noch Qazvin. Einige Stops unterwegs. Wir verlassen Qazvin und fahren in die Berge und über Pässe nach Garmaroud. Auf dem Weg besuchen wir die Ruinen der Alamut Burg, welche ein strategischer Ort der Assasines, einer der tödlichsten Terrorgruppen im Mittelalter, war. Am frühen Abend erreichen wir Garmaroud und haben die Gelegenheit, die Umgebung zu erkunden. Die Umgebung unterscheidet sich sehr start von dem, was wir in den Tagen zuvor erlebt haben. Während den nächsten Tagen überqueren wir zu Fuss die Alamut Berge. Wir starten in Garmaroud und erreichen das Kaspische Meer zwei Tage später. Die Wanderung ist nicht sonderlich anspruchsvoll aber umso eindrücklicher ist die Umgebung und Aussicht. Unser Gepäck wird von unserem Fahrer transportiert, welchen wir auf der andern Seite der Berge wieder treffen. Wir fahren zurück nach Tehran, wo unsere Reise auch schon wieder endet. Individuelle Abreise am folgenden Tag. Die Reise wird von einem Reiseleiter von Beyond Travel begleitet. Einige Aktivitäten setzten eine gute gesundheitliche Verfassung voraus. Es liegt in der Verantwortung der Teilnehmer, dass sie genügend fit sind. Die Reiseleitung wird alles daran setzten, dass die Reise wie geplant durchgeführt werden kann und bietet grösstmögliche Unterstützung. Die Reise kann wegen Naturereignissen oder politischen Entwicklungen kurzfristig geändert werden. In einem solchen Fall ist die Reiseleitung bemüht, ein gleichwertiges Programm zu offerieren. Es gelten die ARVB von Beyond Travel.